Illustration: I just barely found this in time as I was looking for an illustration. 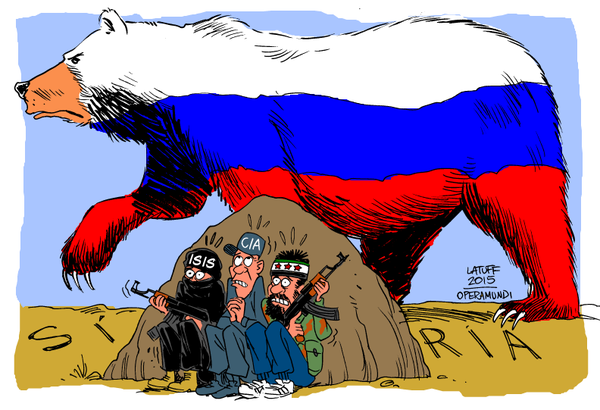 Carlos Latuff depicts the situation exactly. So Russia is bombing in Syria. Russia was invited, so it is the only country bombing there legally. Lavrov said "We are very polite people and don't go where we are not invited." Photos of the wounded and dead appeared even before the first Russian planes took off, giving a strange meaning to the term "time-lapse photography." There has been considerable confusion, mostly deliberate, as to what it means. For example, John McCain was busy recently complaining about Russia bombing what we call "moderate" rebels. Even worse, we know these are good guys, he points out, because they are CIA trained. Well, so was Pinochet. I think the issue of overthrowing governments we do not like has been settled, that whatever government a country has belongs to it, but apparently whatever opposition there is to any government, if it is CIA trained, is more legitimate. As best we can make out, that seems to be the prevailing opinion on our "mainstream media," or Corporate Media, here in the U.S.
Now what would a CIA trained militia be trained to do? I think we made it clear that it was not a good idea to kill Saddam Hussein and to take over his country. This is despite the fact that we saw videos of our own people arming him so that he would attack Iran. It was clear that he had no weapons of mass destruction. He had no link to the Taliban. Osama bin Laden despised him, mainly because of his co-operation with us. However, Georgie decided to invade and overthrow his government and then dismantle it. Once that happened, there was nobody left who could run anything. This was called "debathification." As a result, we spend trillions, lost thousands of lives, etc. The country is still a wreck and, if anything, very close to Iran. The only nuclear weapons development in Iran took place under the Shah, but we digress. We did the same in Libya more recently, having learned nothing from our mistakes in Iraq. The results are clear and we see refugees coming from there by the thousands. Under Gaddafi, most of the people who moved to Libya stayed there and were employed. In other words, removing the basic infrastructure of a country, its government, leaves it in a mess and it becomes a haven from terrorists. ISIL started in Iraq and spread. It is in Libya now. It is in Syria now. Our solution is to remove the legitimate government of Syria. See, if we remove Assad, ISIL will go away. I'm not making this up. So, Putin's idea is to support Assad as Syria has official relations with Russia. If the government of Syria is helped to become more secure, it will then be able to fight ISIL. The so-called "moderate rebels" are most heavily concentrated in areas near the Russian ports or bases. They can hardly expect impunity, CIA trained or not. The other argument made is that this is a way to take our minds off Ukraine. Well, in Ukraine there are influential groups calling for war with Russia and who call themselves Nazis. They do not like to be called "Neo-Nazis," mind you, just Nazis. The Government there is a result of a coup, one that we liked and we have Hillary saying that Yaz would be a good choice (he is one of the puppets we liked). The Yalta system was truly born in travail. It was born at the cost of tens of millions of lives and two world wars that swept through the planet in the 20th century. Let's be fair: it helped humankind pass through turbulent, and at times dramatic, events of the last seven decades. It saved the world from large-scale upheavals. However, I'd like to point out that there have always been differences in the UN throughout the 70 years of its history, and that the veto right has been regularly used by the United States, the United Kingdom, France, China and the Soviet Union, and later Russia. It is only natural for such a diverse and representative organization. When the UN was first established, nobody expected that there would always be unanimity. The mission of the organization is to seek and reach compromises, and its strength comes from taking different views and opinions into consideration. The decisions debated within the UN are either taken in the form of resolutions or not. As diplomats say, they either pass or they don't. Any action taken by circumventing this procedure is illegitimate and constitutes a violation of the UN Charter and contemporary international law. We all know that after the end of the Cold War the world was left with one center of dominance, and those who found themselves at the top of the pyramid were tempted to think that, since they are so powerful and exceptional, they know best what needs to be done and thus they don't need to reckon with the UN, which, instead of rubber-stamping the decisions they need, often stands in their way. That's why they say that the UN has run its course and is now obsolete and outdated. Of course, the world changes, and the UN should also undergo natural transformation. Russia is ready to work together with its partners to develop the UN further on the basis of a broad consensus, but we consider any attempts to undermine the legitimacy of the United Nations as extremely dangerous. They may result in the collapse of the entire architecture of international relations, and then indeed there will be no rules left except for the rule of force. The world will be dominated by selfishness rather than collective effort, by dictate rather than equality and liberty, and instead of truly independent states we will have protectorates controlled from outside. By the way, this brings us to the issue of the so-called legitimacy of state authorities. You shouldn't play with words and manipulate them. In international law, international affairs, every term has to be clearly defined, transparent and interpreted the same way by one and all. We are all different, and we should respect that. Nations shouldn't be forced to all conform to the same development model that somebody has declared the only appropriate one. It seems, however, that instead of learning from other people's mistakes, some prefer to repeat them and continue to export revolutions, only now these are "democratic" revolutions. Just look at the situation in the Middle East and Northern Africa already mentioned by the previous speaker. Of course, political and social problems have been piling up for a long time in this region, and people there wanted change. But what was the actual outcome? Instead of bringing about reforms, aggressive intervention rashly destroyed government institutions and the local way of life. Instead of democracy and progress, there is now violence, poverty, social disasters and total disregard for human rights, including even the right to life. I'm urged to ask those who created this situation: do you at least realize now what you've done? But I'm afraid that this question will remain unanswered, because they have never abandoned their policy, which is based on arrogance, exceptionalism and impunity. Power vacuum in some countries in the Middle East and Northern Africa obviously resulted in the emergence of areas of anarchy, which were quickly filled with extremists and terrorists. The so-called Islamic State has tens of thousands of militants fighting for it, including former Iraqi soldiers who were left on the street after the 2003 invasion. Many recruits come from Libya whose statehood was destroyed as a result of a gross violation of UN Security Council Resolution 1973. And now radical groups are joined by members of the so-called "moderate" Syrian opposition backed by the West. They get weapons and training, and then they defect and join the so-called Islamic State. It is equally irresponsible to manipulate extremist groups and use them to achieve your political goals, hoping that later you'll find a way to get rid of them or somehow eliminate them. I'd like to tell those who engage in this: Gentlemen, the people you are dealing with are cruel but they are not dumb. They are as smart as you are. So, it's a big question: who's playing who here? The recent incident where the most "moderate" opposition group handed over their weapons to terrorists is a vivid example of that. Now that those thugs have tasted blood, we can't allow them to return home and continue with their criminal activities. Nobody wants that, right? Russia has consistently opposed terrorism in all its forms. Today, we provide military-technical assistance to Iraq, Syria and other regional countries fighting terrorist groups. We think it's a big mistake to refuse to cooperate with the Syrian authorities and government forces who valiantly fight terrorists on the ground. We should finally admit that President Assad's government forces and the Kurdish militia are the only forces really fighting terrorists in Syria. Yes, we are aware of all the problems and conflicts in the region, but we definitely have to consider the actual situation on the ground. Nevertheless, NATO has kept on expanding, together with its military infrastructure. Next, the post-Soviet states were forced to face a false choice between joining the West and carrying on with the East. Sooner or later, this logic of confrontation was bound to spark off a major geopolitical crisis. And that is exactly what happened in Ukraine, where the people's widespread frustration with the government was used for instigating a coup d'état from abroad. This has triggered a civil war. We are convinced that the only way out of this dead end lies through comprehensive and diligent implementation of the Minsk agreements of February 12th, 2015. Ukraine's territorial integrity cannot be secured through the use of threats or military force, but it must be secured. The people of Donbas should have their rights and interests genuinely considered, and their choice respected; they should be engaged in devising the key elements of the country's political system, in line with the provisions of the Minsk agreements. Such steps would guarantee that Ukraine will develop as a civilized state, and a vital link in creating a common space of security and economic cooperation, both in Europe and in Eurasia. These issues affect the interests of all nations and influence the future of the entire global economy. That is why we propose discussing those issues within the framework of the United Nations, the WTO and the G20. Contrary to the policy of exclusion, Russia advocates harmonizing regional economic projects. I am referring to the so-called "integration of integrations" based on the universal and transparent rules of international trade. As an example, I would like to cite our plans to interconnect the Eurasian Economic Union with China's initiative for creating a Silk Road economic belt. We continue to see great promise in harmonizing the integration vehicles between the Eurasian Economic Union and the European Union.